Yesterday at Shree Peetha Nilaya we all rejoiced as Sri Swami Vishwananda graced us with his physical presence during evening prayers and made himself available for a short Satsang, giving the opportunity to everybody present in the temple to ask him questions. In the last 10 days, Sri Swami Vishwananda had a very busy events' schedule abroad (7 days in South Africa and 3 days in London), so we thought that he would deservedly take some rest before the events of the next intensive weekend at Shree Peetha Nilaya, which include a Darshan and 2 days of Sri Maha Lakshmi Yagna. 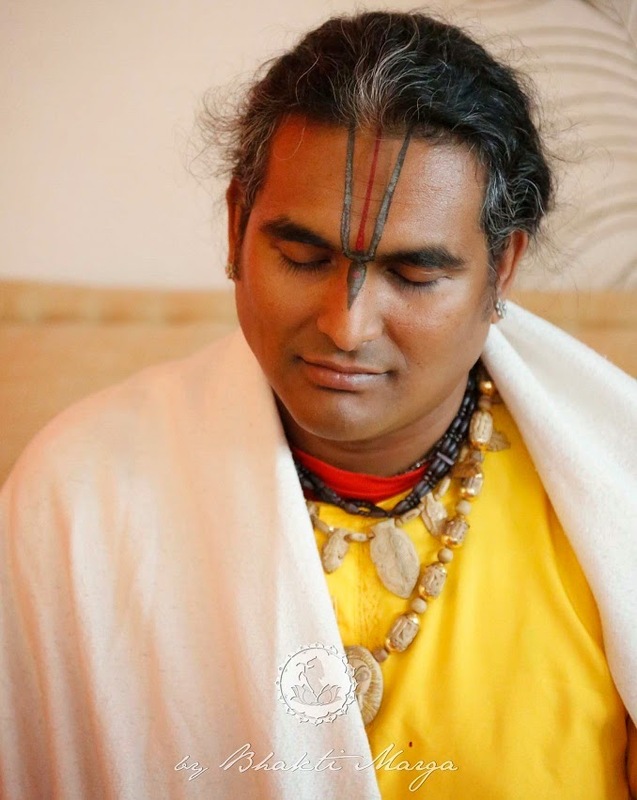 On the contrary, again and again, Sri Swami Vishwananda shows everybody that God forgets about Himself and becomes the servant for the sake of His Love for mankind. 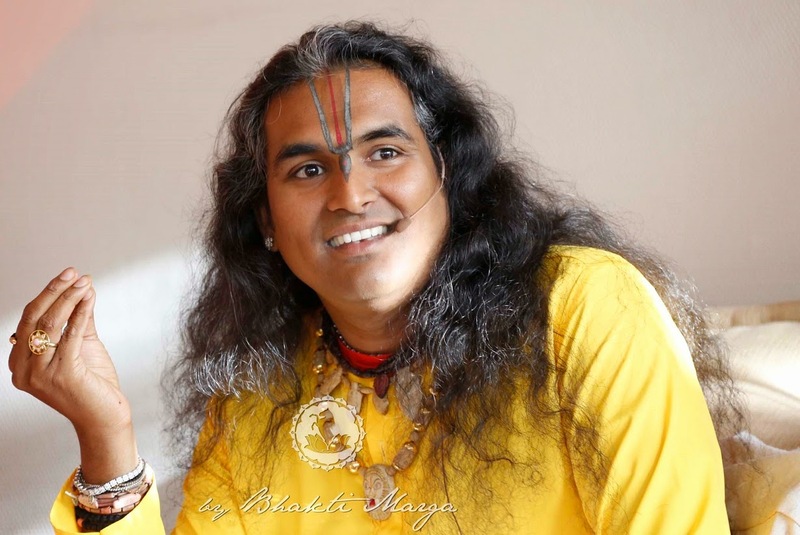 During the Satsang, Sri Swami Vishwananda gave very interesting answers to a few pertinent questions (please see excerpt below). 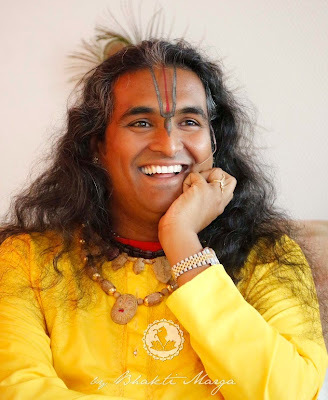 Question: Dear Swamiji, could you please tell us about the connection between our thoughts and the weather, in particular the calamities on Earth, like it had recently happened in Nepal. Is it connected to our mind? "Yes, the mind has a great impact on nature, actually. Nowadays, you see how the mind of people function. 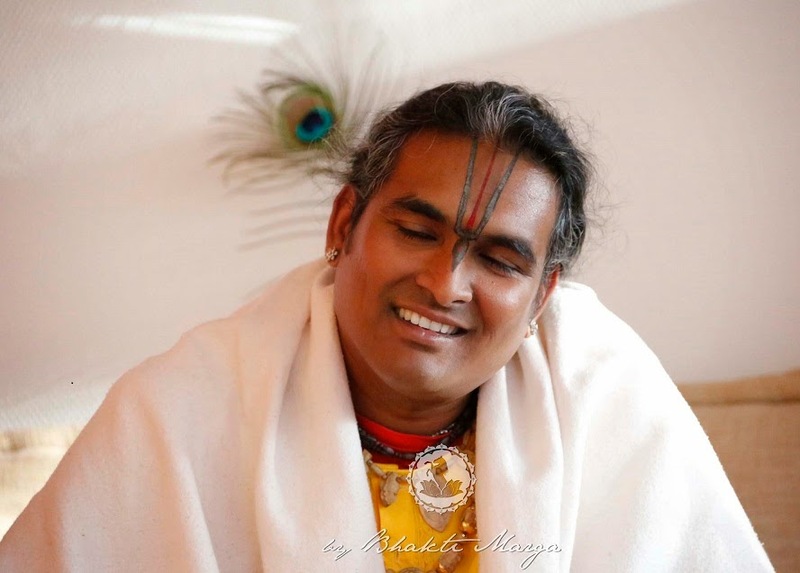 Human beings forget that they are the Atma. Of course, the Atma is not something that you can easily perceive. You have to do something to achieve that level of perception. That's why people find it difficult, because nowadays everything is given with just one touch of a button. Then, what is happening to the mind? The mind, in place of becoming positive, is degrading itself, because everything becomes so easy that we don't need to utilise the mind to do anything. So, the mind will automatically run towards negativity. The mind is like a magnet and whatever you feed the mind with, that's what the mind becomes. So automatically, when the mind runs towards the negativity it becomes negative, because that's what it is attracted to. Then, by attracting negativity what will happen to your inner potential, to the creative energy which God has given you? Do you think you will create anything positive? No, you start creating negativity, your whole vibration becomes negative. So, you can't expect that the people around you will be joyful and happy. Your vibration reflects on the people around you. They also feel your negativity and participate into it. That's how the minds intoxicate each other. So, your negativity also affects the people around you. In a global way, even if it starts with just one person, it reaches a mass of people; and the effect of all people together does react on nature, causing what you see happening in the world nowadays. Nature is Prakriti Shakti and you are part of nature, isn't it? On the other hand, one's positivity also reacts upon nature, but people don't want to be positive. People don't want to see the positive changes happening, because they are so happy to see the negative things happening. Who is responsible for what has happened in Nepal recently? It's mankind. It is said that during some festivities two hundred fifty thousand innocent animals were slaughtered. How can any positivity come out of that? Nature has to balance itself when any act of aggressiveness, of cruelty, is done to nature. Don't think that these animals which were slaughtered were happily saying, "Oh, we are going to be slaughtered as an offer to the Divine Mother! Yippee! Yippee!" No! They were suffering! And do you think that this suffering ends when the animals die? No, it doesn't. They appealed to the Mother. And, you see, the Mother to whom the people did the offerings is like Maha Kali. Maha Kali is not soft, isn't She? She gives the same back. So, nature balances itself in that way. Like that, we can't expect the whole world to change now, but you can change yourself! By changing yourself, it will react on all around you and that will react on nature itself, because we are all linked together. There is a flow of God's life energy which connects us all. Therefore, the mind does have a big impact upon nature. You can see that in your life itself: when you feel miserable, everything around you becomes miserable; even the people who come on your way are miserable, because you attract them. But when you are happy, everything is fine and even things which seem not fine are transformed into fine. The mind has been given not to dwell on things which are limited, but to access something greater inside of you. It is through the controlling of the senses that you achieve the control of the mind and then from that your awareness is transformed and you realise your unity with everything, your unity with Bhagavan Himself. 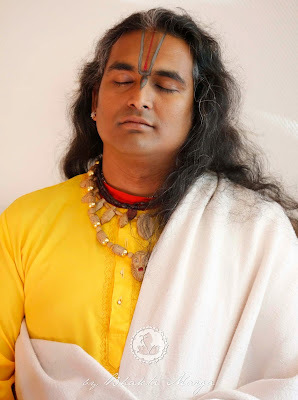 Because as He is omnipresent, He is present in everything, in each atom. So, once you perceive Him inside of you, you perceive Him in everything."